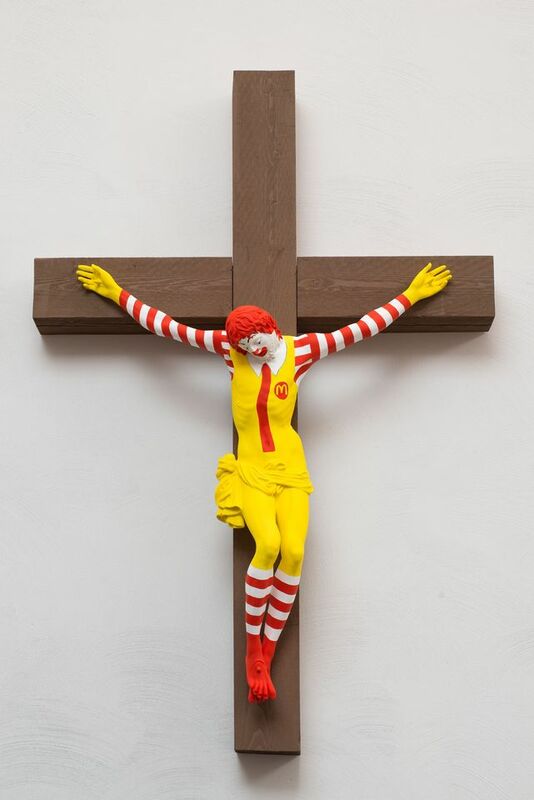 Hundreds of Christians protested outside the Haifa Museum of Art in Israel on Friday against Jani Leinonen's McJesus sculpture of a crucified Ronald McDonald, conflating the American fast-food chain with the crucifixion. Yet the Finnish artist insists that he requested the work be removed from the museum's Sacred Goods exhibition (until 17 February) last September and that it is on display against his wishes. Violent clashes broke out between Christian protesters who tried to storm their way into the museum and the police, after a molotov cocktail was thrown at the museum the day before. One of the protesters complained that the government was slow to respond because the work—on display since August—mocked Christianity and not Judaism. “If they put up [a sculpture of] Hitler with a Torah scroll they would immediately respond,” he told the Walla news site, according to The Times of Israel. The museum refused to remove the work but, following a meeting with church leaders and officials from the Haifa Municipality, agreed to erect a sign at the entrance to the exhibition explaining it contains potentially offensive content. The Sacred Goods exhibition, which focuses on contemporary artists' responses to issues of religion and faith in consumer society, also features “provocative” works by Magnus Gjoen and Nick Stern in which the crucifixion image “appears as a subversive element”. The Haifa Museum of Art did not respond to requests for comment.